Bhitarkanika National Park. The world of nature is full of wonders sometimes tender, sometimes awe inspiring but all the time exciting. Some of them defy description and transcend perception. Such a land of rare and unmatched beauty is Bhitarkanika - a wonder in the wild. Widely acclaimed for its biodiversity in flora and fauna, it is the second largest compact mangrove ecosystem in India. It is also a Sanctuary and National Park. Extending over more than six hundred square kilometers, it is one of the very few evergreen repositories of most luxuriant mangrove vegetation in the world. More than sixty varieties of mangrove plants are found here which provide home to a variety of rare and endangered species. The pneumatophores, better known as breathing roots, stand like sentries of the land. Bounded by rivers on the three sides and the sea on the fourth, Bhitarkanika is criss- crossed by numerous creeks and canals which finally meet the sea and make the estuarine delta, the playground of the Bay of Bengal. When the tide enters, the forest floats and the water kisses the foliage. As it recedes, the multi layer mud flats on the banks of the creeks expose their bosom with fiddler crabs, mud skipper fish, little reptiles and the like. It's a sight to behold. This deltaic region comprises a couple of tiny islands formed by the meandering creeks. With Dangmal at the centre stage (the others being Ekakula, Habalikhati etc), Bhitarakanika is a natural habitat of a lot of wild creatures like Crocodiles, King Cobra, Pythons, Wild Pigs, Rhesus Monkey, Sambars, Spotted Deer etc. There is a Crocodile Breeding Farm at Dangmal. The pride possession of this Farm is the White Crocodile Sankhua, a rare species in the World. Over 170 species of resident and migratory birds of different hue enhance the beauty of the wild. Prominent among them are King Fisher, Open billed Storks, Sea Eagles, Kites, Sand Pipers, Darters, Whistling Teals, Sea Gulls, etc. The chirping of birds nesting at Baga Gahana is sure to leave an indelible impression in any one¿s mind. Watching the wildlife in their natural habitat while cruising through the creeks is a thrilling experience. A trek on the laid out routes will also be equally rewarding. Another amazing phenomenon of nature here is the visit of Olive Ridley Sea Turtles to Gahirmatha in lakhs twice every year between January and March to lay eggs en masse. An unexpected additional attraction is the remains of the 9th century monument - a temple dedicated to the worship of Lord Shiva and the other, a Shakti Shrine at Dangmal. Away from the blinding lights and deafening sound, Bhitarakanika is a different world altogether, a real retreat in the lap of nature. Once in here, the world outside will virtually disappear. Back in work place, the memory will haunt like a fairy tale. Best time to visit Bhitarkanika National Park - October to June. The world of nature is full of wonders sometimes tender, sometimes awe inspiring but all the time exciting. Some of them defy description and transcend perception. 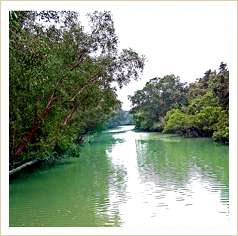 Such a land of rare and unmatched beauty is Bhitarkanika - a wonder in the wild. Permission to visit Bhitarakanika can be obtained from Divisional Forest Officer, Rajnagar, PIN: 754225, Ph: (06729) 272460 or Assistant Conservator of Forests, Chandbali, Pin. 756133, Ph: (06786) 220372 on payment of prescribed fees. Regular bus services are available to Chandbali and Rajnagar. 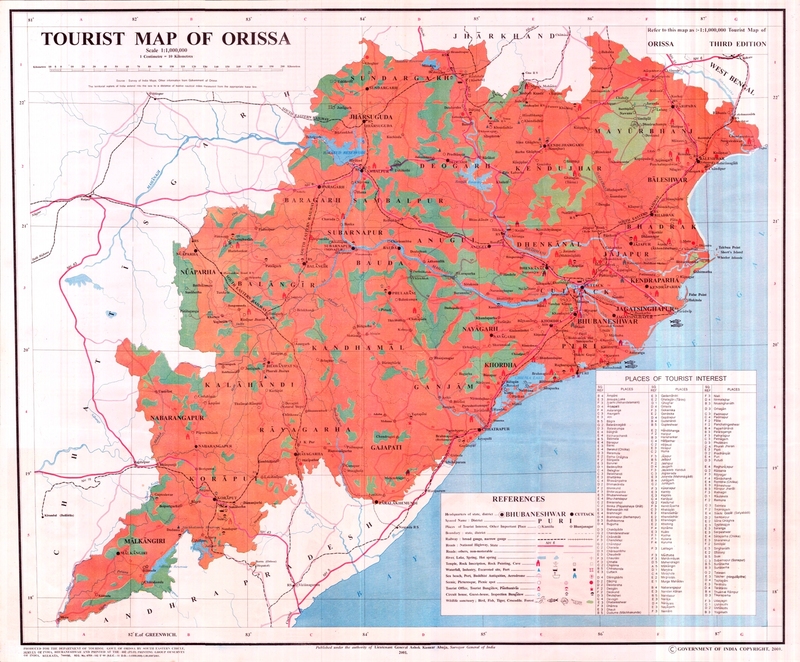 Tourist can also stay at Kendrapara (STD code-06727) -45 kms from Raj Nagar and 70 kms from Gupti. Economical and comfortable accommodation also available here. Close to the Bhitar Kanika Sanctuary is another of Orissa's special sanctuaries - the Gahirmatha Marine Sanctuary. This stretch of beach is the breeding ground for the giant Olive Ridley Turtles, who travel all the way from the Pacific Ocean to mate and lay their eggs here. Every year, thousands of these wondrous creatures come to lay eggs here. In order to protect the turtles, special arrangements have been made by the Government of Orissa. Enjoy simple but delicious vegetarian or non - vegetarian ethnic Odia / Indian dishes, hand made especially for you. Alternatively, you can also rely on the meal facilities as provided by Aranyanivas, Chandbali and Forest Lodge - Dangmal, Ekakula, Gupti and Habalikhati. 1. Do not make noise while watching the birds / animals. You are visiting the national park/sanctuary for watching the birds, not disturbing them. 2. You need to be extra careful in case you are going for bird watching during the breeding season of the birds. 3. Never ever touch the eggs of the birds and do not even venture around the nest for too long. 4. Birdcalls / animal sounds should never be used for attracting the birds / animals. It causes unnecessary confusion and disturbance amongst them. 5. Follow all the rules as well as the instructions given at the national parks and wildlife sanctuaries. Export of most wildlife and their products is either banned or strictly regulated. Export of the few permissible items - even as passengers' personal luggage, is permitted only under an appropriate export permit. Insist on getting a certificate for the legitimate sale of a particular animal product and permission for its export to avoid inconvenience at the time of departure. 6. Do not litter while inside the park/sanctuary. It is advisable to carry the trash back with you and put it in a rubbish bin. 7. Please enter the Park only after taking the necessary permits and follow all the rules. 8. Drive slowly in the Park. In this way you can see, observe and enjoy the most, without disturbing the wildlife. 9. Respect the wild animals and maintain a safe distance from them. Remember, you are in their home and they get first priority. 10. Switch off your car stereo or transistor. The quieter you are, the more the chances of your seeing wildlife. 11. Wear dull-colored clothes. Bright colors alarm most wild animals and they flee. 12. Don't carry guns or other weapons. Feel free to shoot with a camera instead. 13. Do not smoke or light campfires in the forest. Accidental fires can destroy this wonderful jungle in no time. 14. Don't get off your vehicle at any point in the Park except where it¿s allowed. This is for your own safety and the safety of wildlife. 15. Help keep the park pollution-free. While inside the park, please put your entire non-biodegradable litter (tin cans, plastic, glass bottles, metal foils etc.) into the bag provided and dispose it off on your way out. 16. Keep to the specified roads and trails. Driving off track you may trample growing trees and cause disturbance to resting animals and their young.